With a sport as ancient as sumo, trading cards aren’t the first things that spring to mind when you think of memorabilia. A person could be forgiven for assuming that if such cards existed, they must be just a recent concession to western tastes. The reality however is quite different. Sumo cards in various forms have been around since the 1800s (and even a century earlier if you count clay and lead versions). 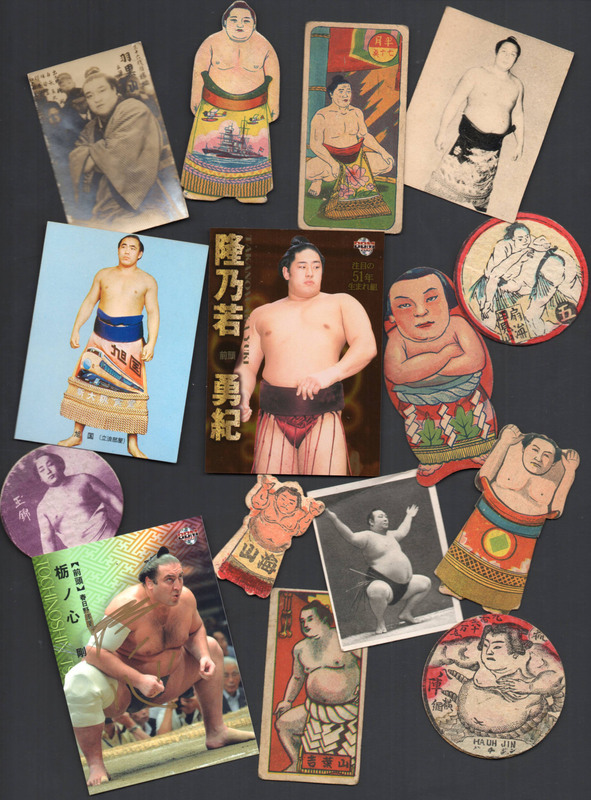 As with baseball cards, the golden age of sumo menko (as they were known) is considered by many to be the late 1940s to early 1960s. Modern era cards were first produced in the late 1990s and while production and number of cards peaked in the early 2000s, new collections are still released every January. Sumo has followed the lead of American sports with limited editions, autographed cards and even cards containing pieces of wrestler’s yukata. There were several unique sumo cards in the 1998 collection. “Aroma of Bintsuke” was a scratch-and-sniff five-card insert set that allowed you to experience the distinctive smell of sumo hair wax in your own home. Other sets had cards that, when combined, gave you a picture of a rikishi’s handprint. 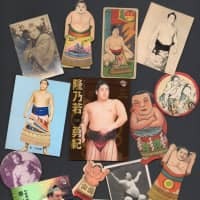 Virtually all collections are produced domestically, but American company Upper Deck created a special limited-edition set for yokozuna Akebono’s retirement ceremony that was only available on that day at the Kokugikan. The most comprehensive guide to the thousands of cards that have been produced over the past century and a half also comes from America. Ryan Laughton’s “Sumo Menko & Card Checklist” is a 354-page tome that is now in its fourth edition. The fact that the most authoritative source of sumo card information comes from abroad once again highlights sumo’s growing international audience, and is illustrative of just how knowledgeable that fan base is.